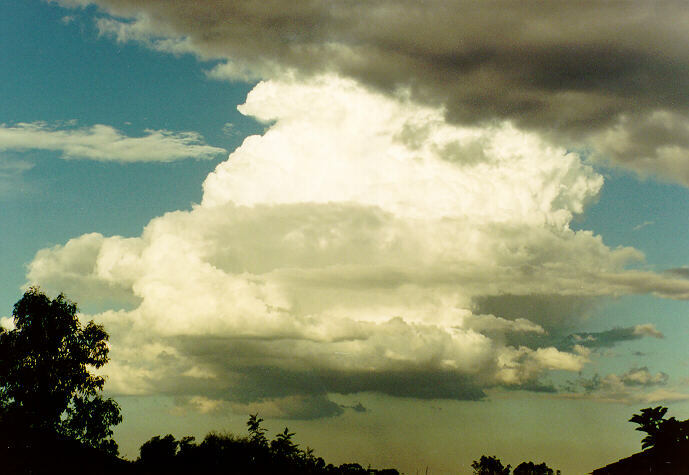 Most people have developed some concept of cloud structure. Cloud is a representation of water vapour in its liquid or solid state and is why they are visible. 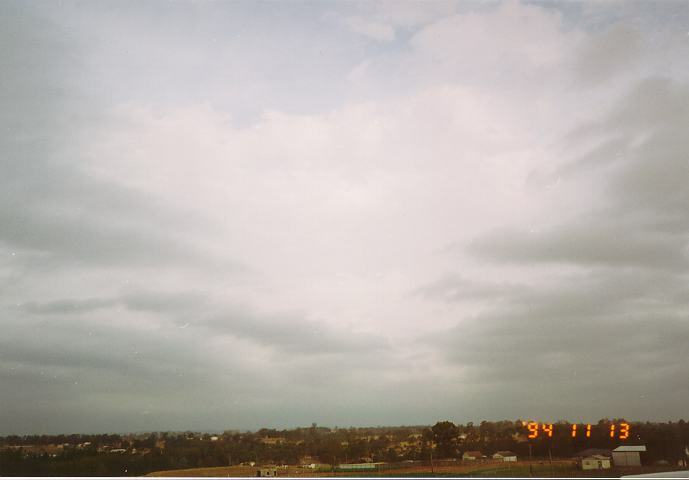 The typical features that are normally associated with clouds are that they normally consist of white tops and dark bases. Now it is important to note that we are referring to three dimensional shapes and that clouds are part of this three dimensional space. You only can see the outer component or boundary surface. If you can see one part of a cloud you cannot possibly see the other side because it is hidden from your view by the inner core of the cloud. 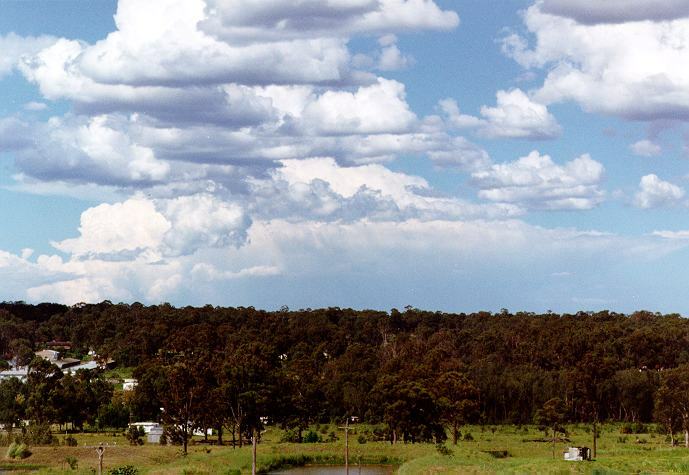 The base or bottom of the cloud is usually darker because sunlight must pass through billions of cloud water droplets or ice crystals from the cloud top or sides (depending on the suns position in the sky). 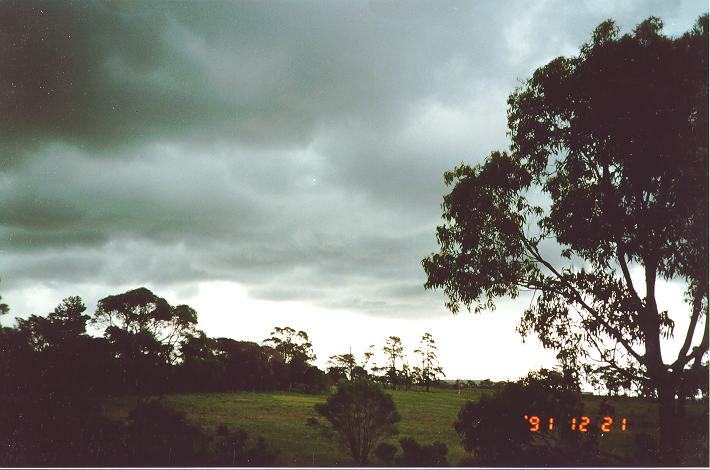 The more condensation that occurs, the more particles available within the cloud mass and therefore the darker the base will appear. Also the larger the cloud, the less sunlight that can penetrate through to the base. 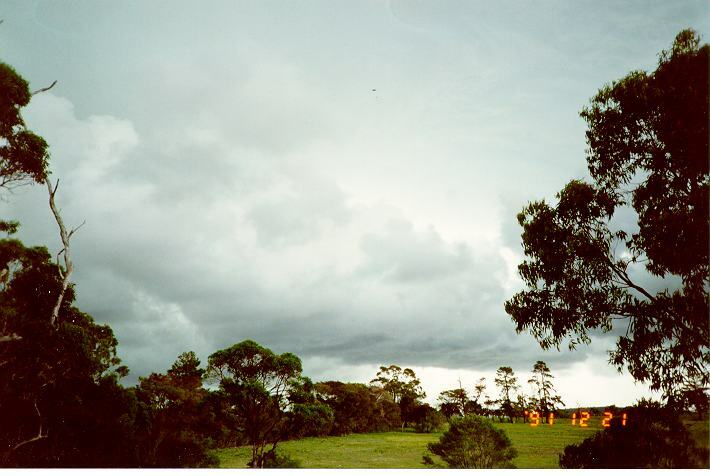 Large thunderstorms therefore usually have very dark bases as a result of the base to top heights. 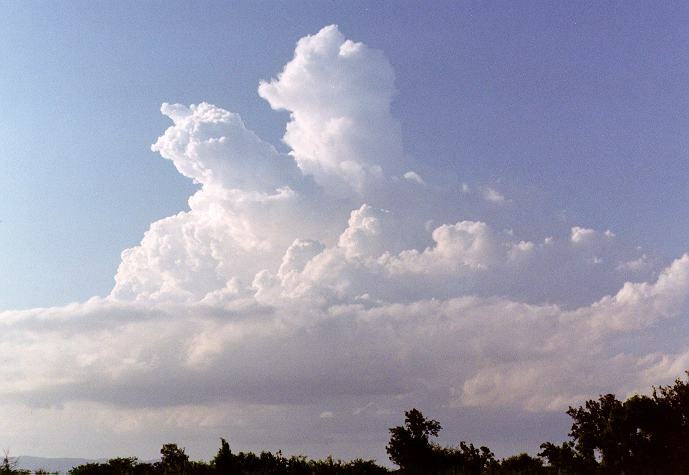 The shapes of clouds depend on how they are formed and their height above the ground. 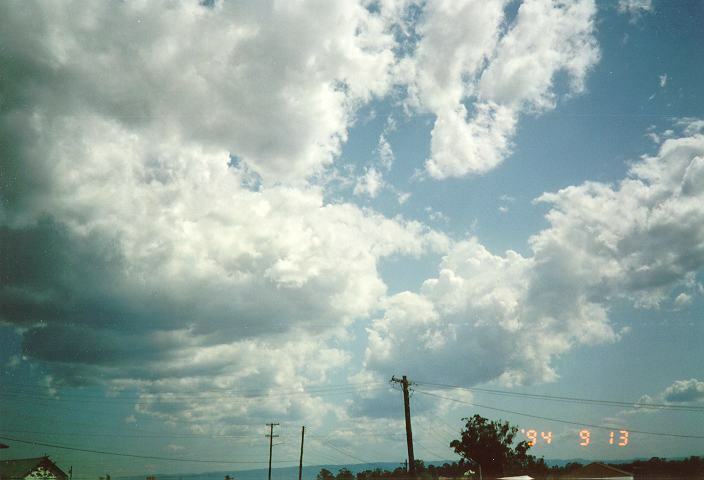 There are several different types of clouds which are classified generally according to height. This classification system will be discussed later in the more advanced observation section. At this stage, we will consider the white, puffy, cauliflower-shaped cumulus cloud which are amongst the easiest to recognise or lines of clouds (stratocumulus). At this stage, we must introduce a three dimensional picture of the cloud. Questions we must try to answer are: How distant is the cloud? Is the cloud a large cloud or is it small? Is the cloud situated at a great height or is it fairly low? Which way is the cloud moving? Is the cloud approaching or moving away? Is there perhaps more than one type of cloud? At this stage, we will assume that the cloud does not change significantly in size and shape. As an observer on the ground, your view is restricted. You therefore must rely on the following three dimensional techniques which can be applied to other weather observations and observations in many other fields. Let us consider that the earth is a sphere and that the clouds move around along a spherical path above the earth's surface. The boundary where the sky seems to meet the ground is the horizon. Of course this will vary in a mountainous region as compared to flat region (plain). The amount of sky observed will be greater over a plain than over a mountainous region. We will assume that our view of the ground is flat although it is slightly curved part of the earth's sphere. If a cloud which we will call cloud A was to approach you directly from the horizon, three observations must be taken into account. First, the cloud will appear to rise from the horizon slowly, until it moves overhead and then towards the horizon on the other side and then disappear. It follows the same pattern. Second, as the cloud rises, it will gradually increase in speed reaching a maximum as it passes overhead and then gradually decrease speed as it 'sinks' towards the other horizon. Third, as the cloud approaches, it will generally appear to increase in size reaching a maximum overhead, even if the cloud is not actually growing. If you have problems following these procedures, apply these concepts to a plane as it approaches you. 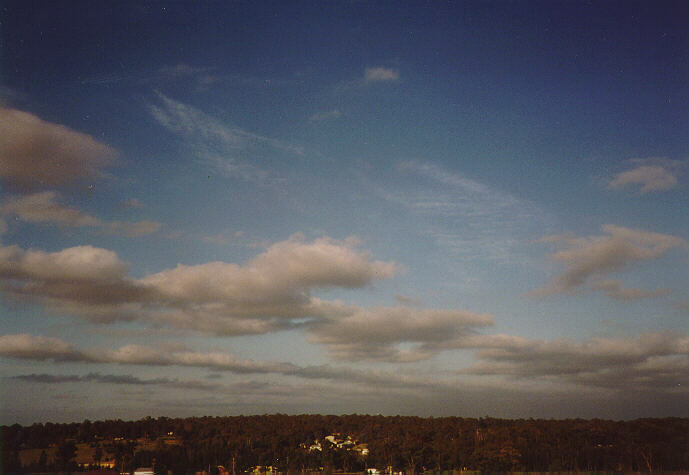 A cloud can be considered like an approaching object, although most people do not generally study clouds and so do not apply these techniques to clouds. Now, consider a cloud B identical in size to cloud A but approaching you over a curved arc in the sky slightly towards the left and at the same time. In this case the cloud will still follow a similar pattern as described in the previous example but to a lesser degree. It will not rise as far upwards. It will appear smaller. It definitely will not pass overhead. A further observation should be noted. 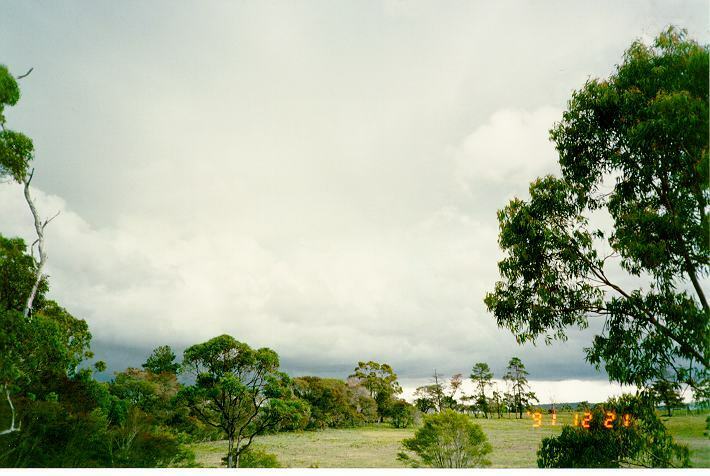 The cloud will appear to move slightly to the left until it passes over the half way point and then begin to slowly move closer towards the other cloud as they approach the other horizon. It should also cover a shorter curved path. A cloud to the right of cloud A will follow a similar pattern to cloud B but remain on the right hand side of the cloud A and its path. AGain, this requires practice. Another observation is that as the cloud approaches, depending on its shape, you will observe more of its base and less of its front outer boundary. As it passes overhead, the base of cloud A will be the only part observed. However, in the case of cloud B, you will observe different views of its outer boundary but still observe its base from different viewpoints. Remember, the further to the left or right that it passes from you, the more of the outer boundary and the less of the base you will observe. The last observation that will be noted is the change in the contrast or varying colour of the cloud. There is no general simple rule for this observation except that the base seems to become slightly lighter as it approaches. This occurs because there is less sunlight passing between you and the cloud as it approaches and hence less contrast. This is especially notable if the cloud obscures the sun. These techniques are difficult to master because they are optical illusions. You simply cannot reach out and feel the clouds. So it is important to practice with real clouds as many times as is necessary to develop a true concept of the shape of a cloud from various viewpoints before proceeding to other observations.